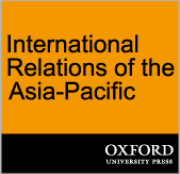 In the context of Asia’s numerous economic miracles in the second half of the 20th century — from Japan to Taiwan to South Korea to Hong Kong to parts of Southeast Asia and more recently China and India — the emergence of Indonesia as an economic and perhaps one day geopolitical powerhouse has been long in coming. To be sure, progress was made under the autocratic 31-year rule of Suharto, which ended in upheaval and a messy transition in 1998, but Indonesia was continually not quite there on the radar of foreign portfolio and direct investors, except in the natural resources sector. The sprawling archipelago of some 250 million people was often perceived as not quite ready for prime time, with a political and economic system mired in corruption, cronyism and nepotism. All of that is rapidly changing. Fourteen years after Suharto, Indonesia boasts one of Asia’s most vibrant and stable democracies. The country has climbed into the ranks of the Group of 20 wealthiest nations, and its nearly US$1 trillion economy managed to sail through the global financial crisis of 2008 relatively unscathed. This has caught the imagination of the international investment community. But Indonesia is still plagued by challenges that rank it below many of Asia’s more successful countries, including dismal infrastructure, a mediocre educational system and inferior health care. Continuing acts of religious intolerance on the part of a small minority of Islamic extremist groups are seemingly tolerated by many top political and religious leaders who are wary of “offending” Islam. 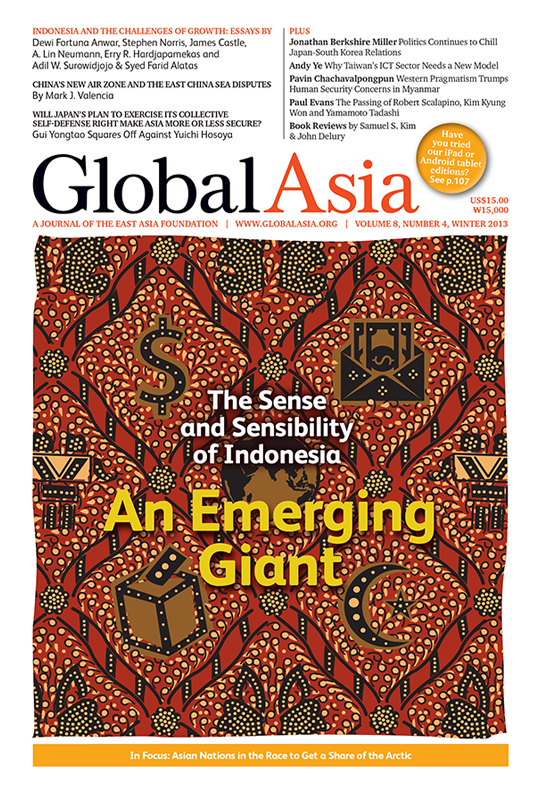 In this issue of Global Asia, we devote our cover package to examining the rise of Indonesia, what it has accomplished and the vast challenges it faces in continuing its remarkable democratic and economic journey. Elsewhere in this edition, we look at the issues surrounding the Arctic and why this frigid region is quickly becoming an important focus of more and more Asia nations. We also debate whether Japan’s decision to assert its right of collective self-defense will make Asia more secure or less. In our feature section, we analyze China’s recent surprise move to declare an Air Defense Identification Zone in the East China Sea that extends into maritime areas claimed by Japan and South Korea as well as by China, some certain to heighten regional tensions; we examine the current state of Japan-South Korea relations; look at how Taiwan needs to reinvent its IT sector; assess the state of human security in rapidly reforming Myanmar; and pay tribute to the recent passing of three great Trans-Pacific cosmopolitans — Robert Scalapino, Kim Kyung Won and Yamamoto Tadashi. As ever, we hope you find the articles in this issue valuable, and we welcome your thoughts and comments at editoral@globalasia.org. 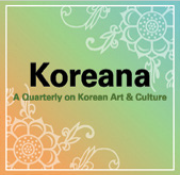 We also invite you to visit our newly redesigned and improved website at www.globalasia.org. Propelled by decades of nearly uninterrupted economic growth, Indonesia is now attracting widespread interest from the international investment community, and is poised to take a greater role in regional and international affairs. 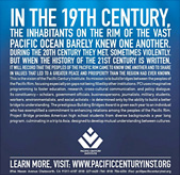 But it faces daunting challenges at home if it is to continue to assume a more prominent place in Asia and the world. Is Religious Intolerance Going Mainstream in Indonesia? Will Japan’s Plan to Exercise Its Collective Self-Defense Right Make Asia More or Less Secure?